Pic: 466 KW solar plant at the Willowvale complex. Credit: Distributed Power Africa (DPA). Speaking at the launch, Econet Wireless chief executive, Douglas Mboweni said the plant will operate under a 25-year Independent Power Producer (IPP) License. He added that the move to use solar energy was a fundamental platform for economic development. 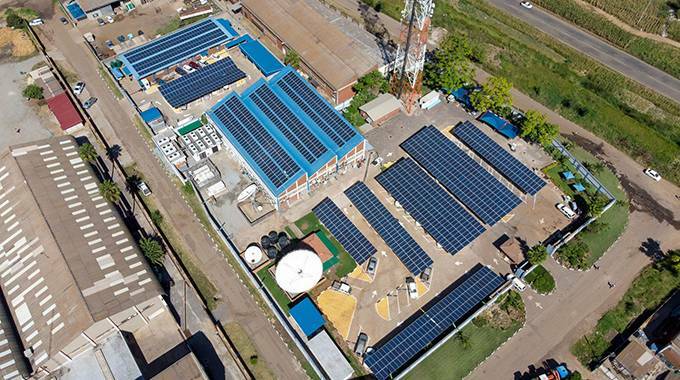 ECONET Zimbabwe says it has invested about US 23 million in clean energy projects through its Distributed Power Africa (DPA) . The company has an ambitious plan to spend US 250 million in clean energy. The business primarily focuses on rooftop solar power systems for commercial and industrial customers. DPA has signed up several commercial and industrial clients totalling 2,7MW. These include organisations in the food, beverages and dairy sectors, schools, farms and small business enterprises.